Glut: a year in my patch: Which is whose? 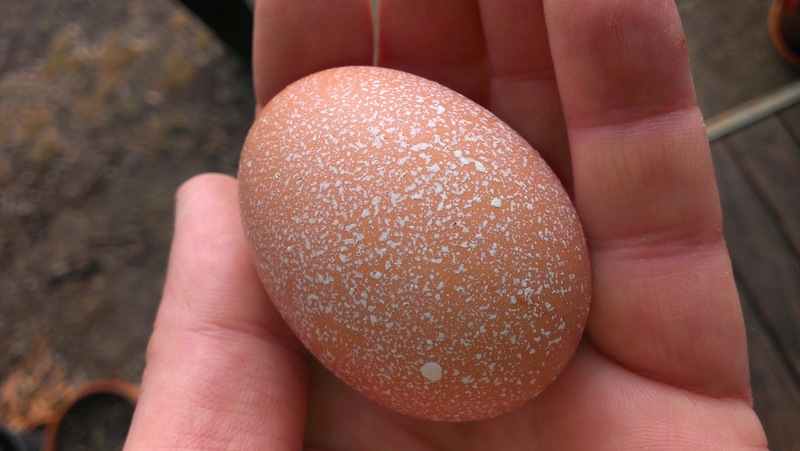 Chicky egg shell colour is genetic - and a multitude of genes are responsible. But egg colour is deposited differently in brown and blue egg laying breeds. Brown laying breeds deposit colour onto the egg just before laying, the last layer known as the bloom - this means that brown eggs are paler inside than outside. 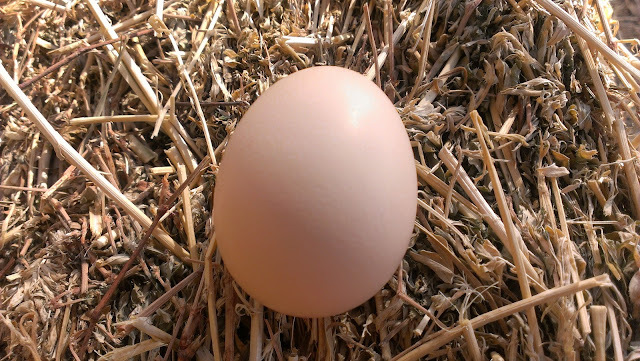 Whereas blue egg colour is deposited throughout the egg development in the oviduct and is thus the same blue inside and out. Green eggs are a result of the two layers mixing, brown on blue. This is what I LOVE about blogging... there is always someone from who you can learn. Brilliant! Thanks for this Chook Egg 101 class, love it! 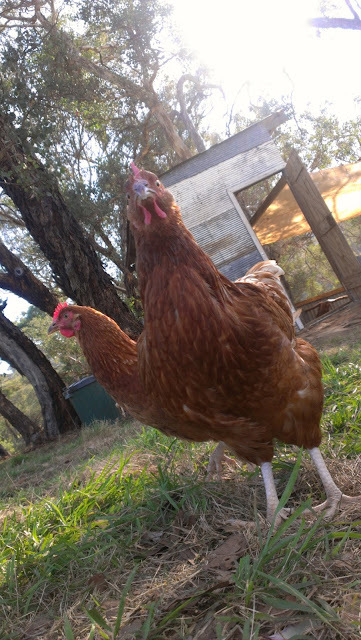 I have two black and white speckly chooks (I can't remember what they are but they are a cross). One has more white than the other (and a larger, redder comb) and she is the one that lays the lighter, almost white coloured eggs, while the one with more black in her plumage, lays a slightly more beige coloured egg. Both are delicious, so no complaints from me! By the way, do you know you need to worm them regularly? I didn't - erk - but do now! Eek! None of the chilly books I have say to worm them, but I guess that makes sense I believe wormwood nibbling acts as a working tonic too. I have planted it next to the coup. They do nibble it. Damn auto correct... That was meant to be chooky, not chilly. Oh, yeah, you need to worm! I won't describe graphically what I saw in some droppings - suffice to say it wasn't pretty. Double erk! I used Piperazine Solution - it's a challenge working out how much to use for just two girls - the dosage on the bottle is per 100 birds! But it seems to have worked - they are due to be dosed again, soon. Maybe someone else has better advice? I know I'd be interested! ... AND I wormed the dog at the same time (with doggy worming stuff) - she shows far too much interest in chook poop. We use Piperazine too, but as it's diluted into their drinking water I find the challenge is to get them to finish drinking it all before they have completed fouled the water (not to mention working out the complexity of the dosage required!) A vet I spoke to who specialises in chickens said that he doesn't trust that method and that you can actually get some sort of worming treatment that you give them directly, but I haven't tried it yet. Not sure if you saw my post on losing one of our chickens but my big tip is to make sure you check them out regularly as their feathers can hide injuries, and if they are hurt or sick they'll hide it so they don't get picked on by the others. I'm jealous of your eggs, our chickens seem to have been moulting forever and we haven't had any eggs for a couple of months! Thanks for this, this is very helpful, and I will look at your said post. I have been able to pick up two of my chickens only so far. They are well used to it now and it will give me a way to inspect them. The other two don't let me pick them up yet - I am confident they will eventually. Strangely it seems that its the ones that are laying that let me pick them up. Yes that's funny the same happened with mine, when they were laying I could pick them up, now that they aren't laying they won't let me! We have three chickens and get 3 eggs a day, we can also tell who's egg is who's. it's such a joy going a collecting them every day!